A loan of $10,000 helped purchase new leather crafting tools, expand our tiny cramped-for-space-workshop and will enable us to speed up our handmade process for the ever-growing orders. My story really starts with my grandfather and his brother who apprenticed at a saddlery shop in Santa Barbara, California after returning from WWII. Before long they set up their own saddlery and leather-repair shop. My Great Uncle Fred was the artisan and was renowned for hand-tooling Western saddles while my Grandfather Bernard was more of the businessman. I like to think I combine their two talents. My father inherited the shop and he and my mother, Alinda, ran it together pretty much right out of high school. My sisters and I grew up in the shop. My parents were 70's arts n' crafts hippies so, from a young age, I was always participating in some kind of “making” activity. As a youth I was very interested in mechanics and spent most of my high school years in auto-shop restoring a 1969 Chevy pickup. We all figured I'd end up a mechanic, but when my grandfather offered to co-pay my tuition if I wanted to try college, I decided to give it a shot. I tried art classes at Santa Barbara City College and suddenly I found my thing. It became incredibly clear what I wanted to do, so I devoted myself to art school and received a degree in Sculpture. After college I returned to Santa Barbara working a variety of day jobs while focusing on my art, showing work in Los Angeles, and also helping out my parents' luggage store. Modernizing my parents leather repair shop really solidified my interest in business. Art-making is, among other things, a constant search for answers to questions. This interest in problem-solving dovetails nicely with my interest in business. So here I am, in my hometown of Santa Barbara, respecting my heritage, pursuing my passion, asking questions and finding answers through design. It will help an entrepreneur expand his handmade leather company. As both a third-generation leather craftsman and as a fine artist I had an affinity with the growing “handmade” consumer movement. And, while mass production has its place and I strongly believe that there are positive aspects to our new global economy, the decline of both American manufacturing in general and quality, handmade/small-scale manufacturing in specific troubled me. I started Make Smith Leather Co. in 2011 as a way to: continue the Soria family tradition of leather craftsmanship; satisfy my own urge to create something new that spoke of my life, interests and education and; make a living participating in what I believe is a positive trend in consumerism. Make Smith was initially conceived as a custom workshop with a focus on handmade one-of-a-kind leather goods and has has since expanded to include private label manufacturing for other brands and a Make Smith brand product line, which aims to make well-priced handmade craftsmanship available to retail customers. Each piece is made by hand, per order, one at a time, in our workshop located in Santa Barbara, California. In keeping with the “buy quality, not quantity” ethos, our products are made to last a lifetime and are warrantied for life, offering an exceptional value for our customers. The reason for requesting a loan is three fold. First, we will use the funding to purchase new leather crafting tools. Second, we need to expand our tiny cramped-for-space-workshop to we will have more room to product our goods. And lastly, I need to hire help to will enable us to speed up our handmade process for the ever-growing orders. We won't be able to keep up in 2018 unless we expand the shop size to accommodate the staff and new equipment footprint. We opened a retail store in October 2017, and spent most of our start up capital just locking down the lease, moving, relocating the space and setting up our equipment. The new space has shown great potential and the demand for our goods has been larger than we could have expected. Very quickly we have realized that we will need to ramp up our production to keep up. We are in a great position to grow, and very easily keep up with the orders because we have a plan to help scale our operation. Scaling our production will make more inventory available, and help bring the cost down a bit. We can increase our revenue at least 20% which will make a huge difference for our business. There are so many amazing benefits when backing this loan. This loan will help me maintain the businesses financial health which directly affects me and my part-time employees. I work here at Make Smith full time, its my only gig, so I’m building this business that will essentially pay three peoples full time salaries. Creating jobs is awesome! Lastly, our community benefits by being able to buy from a local maker instead of having to purchase from overseas manufacturers. 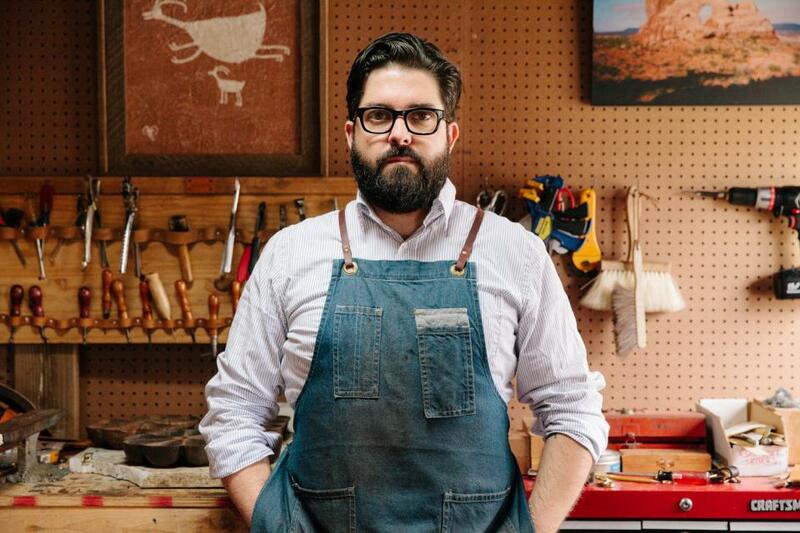 About Make Smith Leather Co.
As a sculptor, Steven of Make Smith Leather Co. believes in the power of art to create new ideas and solve big problems. And as a third-generation leather craftsman, Steven also believes in the power of great quality and locally handcrafted goods to strengthen communities and bolster the economy. Steven is looking for a $10k loan from Kiva to hire more staff, restock inventory, scale up production and expand his leather crafting workshops so more folks in his community can access art making in their lives. Steven has a solid and sustainable business plan for his art-based store and the creative skills to successfully market and sell products he hand makes. Steven has a solidly positive reputation as an engaged and transparent business leader in his hometown of Santa Barbara. Steven is very motivated to expand Make Smith Leather Co. and has successfully fundraised a Kiva loan in the past. Steven is currently pursuing a second round of Kiva funding to help push his work to the next level. Steven is a strong advocate and ally for artist entrepreneurs, has an economically sound plan for Make Smith Leather Co., and most of all, runs just the kind of business we want to see thrive in the community.